Four parts in grey resin; photo-etched fret with 21 parts; clear windows; instructions. Not something that has been readily available in the past, nicely cast and a complete PE package will enhance the finished model. No painting details and an electron microscope may be useful in the application of some of the tiny PE parts (ha ha!). Don’t lose anything as no spares are provided. 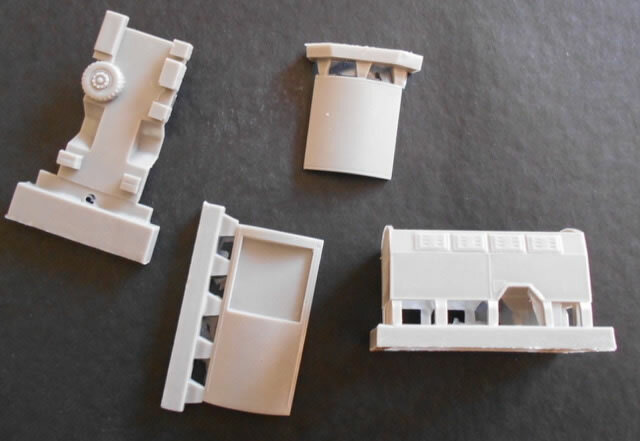 Added to the Revell parts will allow the modeller to produce a finely-detailed and cute little airfield vehicle that will add some scale and interest to a diorama or vignette. 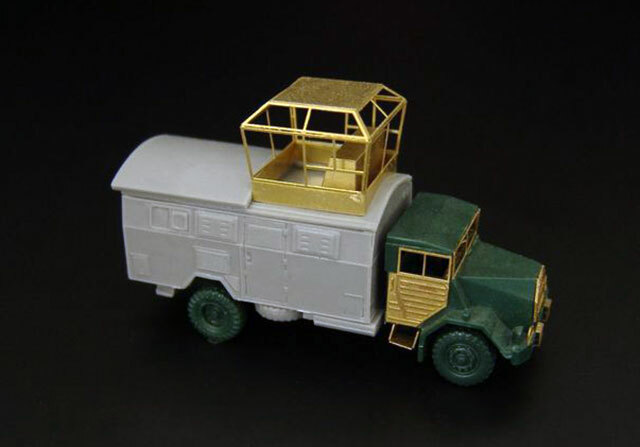 There is no information provided with the kit but the vehicle appears to be a mobile airfield control tower for smaller airfields in Germany and as such would make a useful addition to a diorama or to add scale to a vignette. 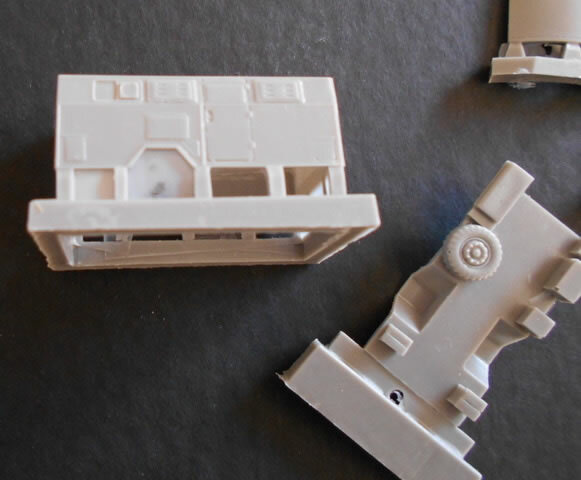 The parts are designed to be mated to the Revell truck cab from set 03351 although I guess the modeller could modify these parts to fit any suitable truck cab/body to produce a representative vehicle. 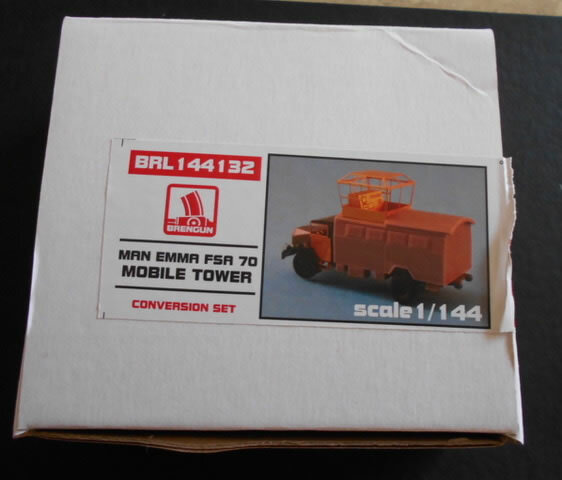 Inside the strong top-opening box there are four nicely moulded grey resin parts - truck chassis and body, and two roof components - with the rest of the conversion being made up of a very detailed 21 part PE sheet and a set of clear windows to be added to the tower. The resin is finely cast as we have come to expect from Brengun and parts are attached to their cores by fine webs that will be easy to sever. Care will still be needed as the parts are delicate and small - the final vehicle will be only 65x20x25mm! Don’t forget to wash all parts before commencing construction After constructing the body and attaching it to the cab section the modeller will have to deal with the PE. This sheet contains some VERY TINY parts such as mirrors and door handles (!) 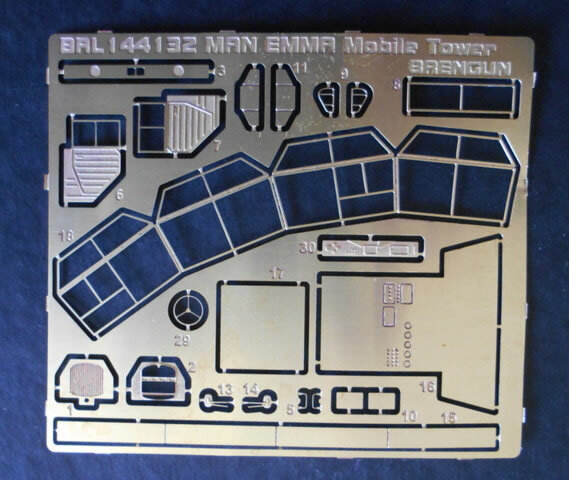 as well as bumpers, steps, doors and window frames, and the single piece that makes up the control tower itself. I would strongly recommend cutting these pieces off inside a plastic bag and then constructing the model on a black card background to avoid losses - no spares are provided. The frame of the control tower is quite a complex fold and will need dexterous use of tools and CA. I would imagine a folding tool would be a must. It encloses a folded control panel. To is is added the clear plastic window pieces, added after painting. No painting instructions are provided and search of the internet was not helpful - my guess would be overall yellow or dark green or possibly the red/white or black/white squared design, although something in the recesses of what passes for my mind these days tells me that these squared patterns are peculiar to the English-speaking world. Anyhoo, its up to you. Instructions come on both sides of a rectangular sheet which is about 1/5 A4 size and are quite comprehensive but have no colour call-outs.